Brown rice is a highly nutritious food. It is a whole grain that is relatively low in calories, high in fiber, gluten-free and can be incorporated into a variety of dishes. Since brown rice is a good source of magnesium, phosphorus, selenium,thiamine, niacin, Vitamin B3 obviously its high in fiber. When the outermost layer of a grain rice (the huskà is removed) brown rice is produce.Brown rice has a shelf life of approximately 6 months but hermetic storage, refrigerating or freezing can extend their lifetime.The cooking time of brown rice needs generally a longer cooking times than the usual white rice.Brown rice and white rice have similar amounts of calories and carbohydrates. I have been cooking with brown rice since a long, however i seriously want to showcase some of brown rice dishes which i usually cook for our weekly menu. I have couple of dishes to post but still i picked this alluring, creamy brown rice payasam aka milk pudding to post for this week's blogging marathon. I prepared this creamy Brown rice milk pudding for this year's Tamil new year's lunch platter. Though i prepared a simple thali for the feast, this brown rice milk pudding turned out our lunch more delicious than i imagined. I used pressure cooker for making this ultimate paal payasam, hence the whole cooking process took me just 15 minutes, yes trust me pressure cooking helps a lot to reduce the cooking time. As much as like most of the payasams, i used sweetened condensed milk to bring the sweetness hence this droolworthy paal payasam turned out more creamy and delicious, obviously this paal payasam turned out extremely yummyilicious. If you are a follower of my space, you guys might have noticed that am running a month of blogging marathon with 4 different themes for 4 weeks. And this week's theme for this Mega marathon is 'Wholegrains'. After dishing out 4 different dishes with rye flour,quinoa,oats, broken jowar, i couldnt stop myself posting this delightful brown rice paal payasam for this week's theme. Cook the brown rice in pressure cooker along with water for 5-6 whistles. Once the steam get released, add the milk,sweetened condensed milk,cardamom powder and cook everything until the kheer gets bit thickens. Heat the ghee, fry the cashewnuts, add this fried cashewnuts along with the ghee to the prepared rice kheer. Paal Payasam looks yummy, Priya. Using brown rice is interesting, it turned out so creamy and i won't mind to slurp them straightaway !! Looks very tempting, Priya. Would love to try it with brown rice. Paal payasam is one of my fav. OMG! 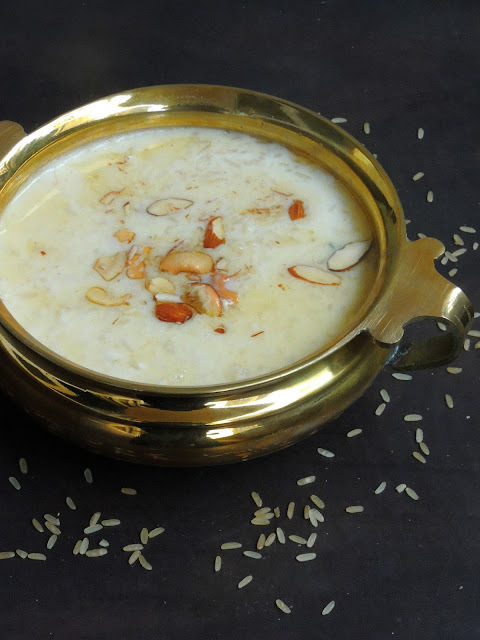 This paal payasam with brown rice looks absolutely delicious. And its is healthier too..
Super idea Priya to include brown rice in Paaysam. We love paal payasam with rice too but I always add white rice? Tastewise any difference Priya? Im a kheer addict ,So i will definitely try this out!! Always tried kheer with white rice.. Brown rice is such a healthy twist!! I gave up getting brown rice for the reason that they take so long to cook..I would loose my patience..but never thought of a pressure cooker..will definitely try and look forward to your brown rice recipes,this kheer sounds absolutely gorgeous. @Srividhya Gopalakrishnan Tastewise i didnt find any difference.Hope this helps. Wow, that payasam looks so creamy and delicious. Can’t believe that you made with brown rice. What a great way to add more fiber and nutrition to diet. A brilliant way to use brown rice.Must have tasted a bit different from the white rice one. I've yet to try making kheer with other types of rice. Oh gosh that bowl of payasam looks so sinful and creamy Priya, I could have it all myself, even though I am not so fond of sweet!.. wow out of adjectives to appreciate this sinful kheer !! such a healthy way to make paal payasam aks !! Am drooling .. 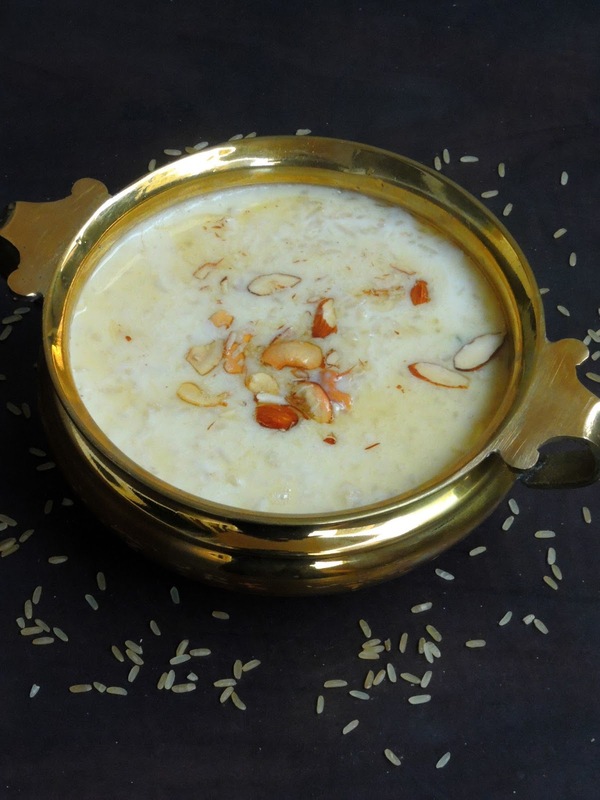 The payasam looks so luscious and love the divine creamy texture of it !! I am eyeing on that urli :D the kheer in that urli is so rustic !! 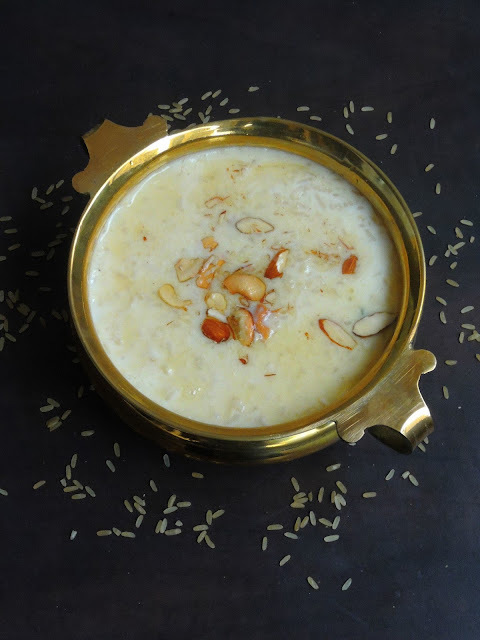 Simple yet delicious payasam! Lovely click with that Uruli! Payasam is one dish, My people won’t get bored of eating! Lip smacking good! Paal payasam with brown rice sounds as inviting as with white rice. I guess it would have tasted even similar too. The brown rice paal payasam looks so delicious. I love the nuttiness of the brown rice and that would be so good in the kheer. I have never made it before and I am definitely trying this next time. Payasam looks so divine in that brass bowl with that garnish of ghee toasted cashews, Priya. I love payasams and want to grab that bowl from my screen. That is one sinful bowl of Kheer PRiya. Never thought of using brown rice in kheer! Thanks for the idea! Rice Kheer with brown rice... awesome choice,.. healthy too.